Albert Einstein tells us that clocks run slower the deeper they are in the gravitational potential well of a mass – the closer they are to a heavenly body, for example. This effect is described by General Relativity Theory as the gravitational red shift – it is detectable in spectral lines that shift toward the red end of the spectrum. General Relativity Theory also predicts that the rates of all clocks are equally influenced by gravitation independent of how these clocks are physically or technically constructed. However, more recent theories of gravitation allow for the possibility that the type of clock indeed influences the degree of gravitational red shift. 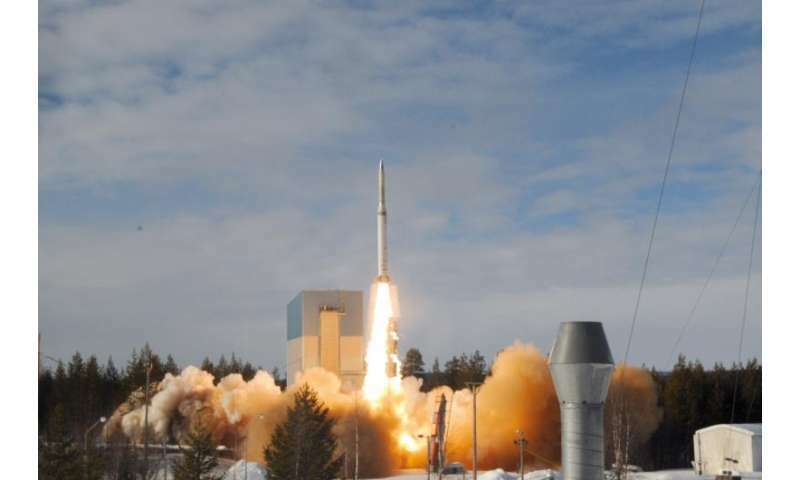 To test this theory-about-a-theory, project FOKUS funded by the German Aerospace Centre (DLR) today launched a high-altitude research rocket to send various types of clocks into space and back again. This is where the most suitable experimental conditions are found because of the large gradient in the gravitational potential (gravity varies there a lot). This permits testing whether there really are differences in how clocks run – and in the end, also whether one of the newer theories of gravity provides a more exact description than Einstein did. The first experiments in space have now been successfully carried out. A team of scien-tists launched an extremely stable quartz oscillator into space that ticks like a modern wrist-watch – but at a very high frequency – together with a complete laser system for purposes of comparison. 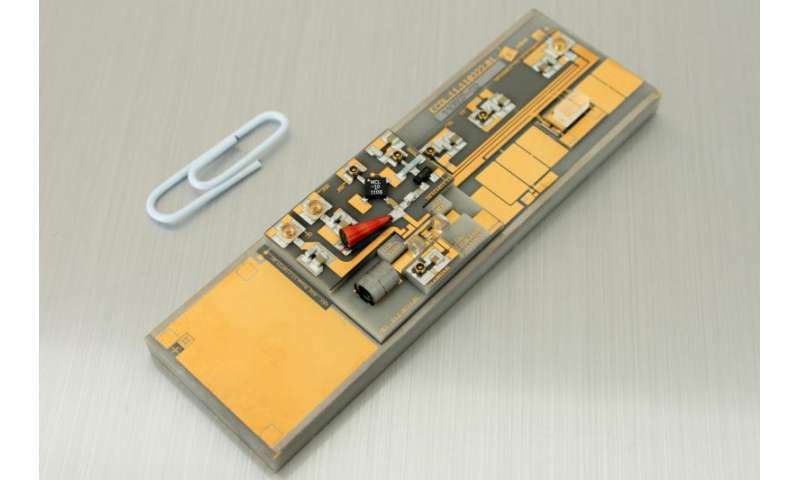 The centerpiece of the laser system is a micro-integrated semiconductor mod-ule that was developed and tested by the Ferdinand-Braun-Institut, Leibniz-Institut für Höch-stfrequenztechnik (FBH) in Berlin. The integration of entire laser system took place at Hum-boldt-Universität zu Berlin (HU Berlin). The frequency of the semiconductor laser was stabi-lized by locking it to a specific electron transition of a rubidium atom in an advanced module developed by Universität Hamburg. These rubidium atoms in conjunction with the lasers pro-vide an "optical atomic clock" that works according to a different physical principle that the quartz clock and "ticks" about ten million times faster than the quartz unit. To compare how the two clocks run, the company leading the project, Menlo Systems, is employing an optical frequency comb they developed. The scientists demonstrated with the tests for the first time that these types of "optical atomic clocks" and the laser systems required for them can be employed in space for testing gravita-tional red shift and other precision measurements. The demanding demonstration of the technology also allowed them to lay the technical foundations for examining Einstein's equiv-alence principle using potassium and rubidium atomic interferometers under the MAIUS pro-ject. MAIUS is part of the QUANTUS mission funded by DLR in which new technologies in-volving quantum physics will be developed for cooling, entangling, and manipulating atoms. It should also advance miniaturizing the laser modules and testing a fully automated quantum sensor in space. The long-term objective in this case is to examine Einstein's equivalence principle by which the acceleration of a body by a gravitational field is independent of the nature of the body – i. e. all objects subjected to the same gravity "fall at the same speed". Countless drop-tower experiments at the Center of Applied Space Technology and Micro-gravity (ZARM), University of Bremen were used to prepare for the sophistiacted experiment in space. The laser module was built at the Ferdinand-Braun-Institut through the Joint Lab Laser Metrology together with the Optical Metrology research group at HU Berlin. The Joint Lab has been investigating and developing ultra-precise and extremely compact semiconductor laser modules for use in space for some time. Their centerpiece is a DFB (distributed feedback) laser that emits light in an extremely narrow wavelength or frequency region. This narrow spectral band characteristic is one of the main requirements for the laser module needed for spectroscopy of the rubidium atoms and the associated precision measurements. With the help of a unique hybrid micro-integration technique, the diode laser chip is assem-bled together with electronic and optical components into an exceedingly compact, space-certified package. The palm-sized modules absolutely have to operate flawlessly under the extremely harsh conditions of space. They are subjected to heavy mechanical loading during liftoff when the acceleration rises to eight times' that of Earth's gravity. "Our integration tech-niques can even withstand up to 30-times' Earth's gravity," says Dr. Andreas Wicht, head of the Laser Metrology Group at FBH, who views his group as well-prepared for future chal-lenges. "In addition, we are working on even narrower bandwidth lasers with a hybrid inte-grated optical amplifier that is highly suited to even more complex experiments." FBH is ex-panding its know-how in both the area of precision optical and spectroscopic measurements. These represent some of the most precise and exact measurement techniques of our time and will open up further applications. Not a valid experiment, QM suggest the potential energy difference may create a delta T+/-dt. Better is to define two separate frames, define a synch time, with identical clocks, define a synch message, transmit message. The following would be previously defined, i.e. priori: Wavelength, a test stream fully defined, multiple test wavelets separated by a defined dt. calculate the known message length or any choice of wavelet and measure the time it takes to travel past you. This would be the speed of the wave-front. If this is unacceptable by "Theory" then is your "measure" relevant? We already know the answer to that puzzle! Still eating the manufactured corn? Unbelievable! So use that to compute dT. But I don't think you know what it means, nothing. Because Wavelength and frequency or Period are defined at the origin. The speed it passes you is the speed between transmitter and receiver. Space is not shrinking, time is not changing, why would anyone not question that? Because Michelson and Morley saw themselves in a mirror? Or is it because you thought sending waves into a slit and the source of the waves into the slit was two different things? No, same experiment! Waves are the relative response of moving particles, everybody see's something different depending upon it's relative velocity. We can only see it if we allow vector addition! This is high school physics. Not some brilliant idea worthy of anyone with a PhD in theoretical physics with billions of dollars fabricating a proof. Limited thinking. Are we this dull? They will find no difference because gravity doesn't affect time, it affects the fabric of space and every benchmark we use to measure time comes from the condition of that fabric. Gravity warps that fabric and thus warps all our clocks. It slows springs, battery reactions, it slows atoms, it slows chemical processes but it doesn't actually slow time. The only way a clock will be unaffected by gravity will be if its in its own independent space. I won't pretend to understand how to test time dilation. I'm no expert. But it appears that this experiment is intended to validate GR's directional time dilation. That seems to be a worthy goal. However, *all* of our cosmological observations and conclusions hinge on the validity of SR's reciprocal time dilation. Reciprocal time dilation hasn't been proven experimentally. And so I am waiting patiently for physicists to get around to demonstrating either that SR's reciprocal time dilation is correct, or it is not correct. If the latter, then a whole lot of changes in cosmology will be required - Dark Energy, for example, will go away. You really see the logical progression of this theory, or merely and easy going guy and think those in the know, really know, without any doubt, i.e. using logic, math, and known physics? That's hilarious, background radiation is evidence of the Big Bang without all the plasma in space reconciled. The best one though is something I contemplated as a kid along with the steady state models, the problem is the spot from "Where" or "When" it began, a space with no points containing space and time! This is simply dismiss-able as nonsense. Or the standard model: :"What's holding the nucleus together?" "I don't know, glueons?" Really? Liquid clocks and shrinking baseball bats! !!! ??? can't sayit. Simply trying to find continuity between two events or objects is like adjusting your measurement for air-flow with a waterfall as the simulator then re-scale??!! Everything calculable using one relative speed! Engineers build your machines, the PhD physicists doesn't seem to be able to determine exactly what the machines are doing or why it was built. Exploratory research or a cash cow for stupid ideas? The palm-sized modules absolutely have to operate flawlessly under the extremely harsh conditions of space. They are subjected to heavy mechanical loading during liftoff when the acceleration rises to eight times' that of Earth's gravity. Sigh. If you want to subject e.g. your cell phone to "eight times that of Earth's gravity", you can take a big bed pillow and drop the phone from two feet on the pillow. -- Seems this author hasn't seen a Physics book. As to the actual experiment, I think it is a good idea. Any (confirmed) anomaly would indicate new physics, and that is always a good thing. At the end of the day, new physics gives us more ways to study the world in even more ways, and maybe also create technology we haven't even imagined yet. "The long-term objective in this case is to examine Einstein's equivalence principle by which the acceleration of a body by a gravitational field is independent of the nature of the body – i. e. all objects subjected to the same gravity "fall at the same speed"." This only applies in a static G field; and it was Galileo that first showed this principle. In a dynamic field, GR predicts changes as a function of mass and even mass distribution i.e. tidal forces. I expect the equivalence principle to hold, (due essentially to equivalently static conditions), but the interesting thing would be if it didn't hold. Rufus, you should learn to count before posting on the science website. Do you have the slightest comprehension what an idiot you look like, when you think Jebus is holding atomic nuclei together? What's "reciprocal time dilation" mean, exactly? It looks like word salad to me. Meanwhile, SRT's prediction of time dilation was confirmed in the 1950s by observation of muons generated from cosmic rays. Maybe you should read some physics from the nineteenth and twentieth centuries sometime before posting on the science web site. Just sayin'. Ummm, GPS has to be adjusted for GR time dilation in order to be accurate. Did you pass fourth grade algebra? Just askin'. gwrede, apologies, I downrated you when I meant another user. Please accept my contrition. I'll find a way to give you some fives to compensate. Da Schneib asked, "What's "reciprocal time dilation" mean, exactly? It looks like word salad to me." I recommend you read Edward Kipreos' paper; it will explain it better than I can. That said, here's my layman's explanation. With directional time dilation, time slows for one moving object while the other doesn't change. That's exactly what GPS requires: if you don't use directional time dilation you get the wrong geoposition. The satellite slows; Earth doesn't. With reciprocal time dilation, both moving objects slow equally; hence there's no requirement to adjust red shift measurements to obtain true velocity. That unproven assumption, contained within SR but not GR, is the reason nobody corrects for time dilation in red shift measurements. Our entire cosmology rests on that assumption. Kipreos is just saying that we really ought to prove reciprocal time dilation is a thing before we hang our hats on an accelerating expanding universe. With directional time dilation, time slows for one moving object while the other doesn't change. Ummm, that's only correct from the frame of one of the moving objects. From the other's frame, the change is equal but opposite. There is no absolute motion. Each sees the other as moving, and each sees time at the other's location as passing more slowly; for example, if they flash a laser at each other every second. Now, why should I bother reading something that denies SR, which has been repeatedly tested and repeatedly proven in literally millions of experiments? Unless one observer becomes non-inertial-- that is, undergoes an acceleration-- they can never meet and compare their clocks. Once one of the two observers undergoes acceleration, that observer's timeline is forever altered, and that observer will turn out to have been the one that experienced time dilation; in terms of the twin paradox, that is the traveling twin, and the traveling twin has to turn around and come back for the clocks ever to be compared. Not to mention having accelerated in order to leave in the first place. Fer cryin' out loud, relativity is a hundred years old, and experiments proving it are conducted in tens of thousands of high schools every year. Fer cryin' out loud, relativity is a hundred years old, and experiments proving it are conducted in tens of thousands of (high schools) every year. Michelson-Morley is replicable with cheap laser diodes and standard optical bench equipment and vibration dampers. With a bit more effort you can do Fitzeau. The muon experiment is, I'll grant you, a college lab experiment. It does not matter how easy the experiment is to perform, the students have to be briefed on the work of J.K. Maxwell to understand why the experiment was first performed. The students need to know about the physics involved in the setup. Finally, the goal of this experiment being to look for or lack their off the expected aether, they also have to understand why the absence of this expected medium lead Einstein to conclude that the speed of light was the absolute speed limit. Without all this 'basic' knowledge you are going to perform an experiment for a crowd of clueless kids. Maybe I was a bit ambitious. Technocreed: the validity of an argument is determined by evidence, not credentials. Here, Kipreos is arguing that although evidence for time dilation is robust, evidence which teases out the distinction between reciprocal and directional time dilation is scant - and the only evidence we have obtained thus far proves directional time dilation. Da Schneib, you are correctly presenting the classical view of frames. Kipreos is indeed challenging us to rethink this view. The truth of this view isn't in the age of an assertion but the evidence for it. As it happens, framing in relativity is the weak link in theory; much of what is asserted about frames is unproven (such as the presumed impossibility of establishing an absolute frame). It's persuasive; it's consistent; it has virtues as a theory. But evidence for reciprocal time dilation doesn't seem to exist. If evidence for it can be acquired, we'll cement SR's place in cosmology unchanged, which would be a good thing. Do you have a clue how to tell the the real worth of a paper? You look at the number of citations. In the case of this paper, after four months of publication, it is a big zero. This number, have my word, is going to be the same for a very lomg time. You know why? (Just look at my first reply to you) AS Da Schneib would say 'Get real'. TC, I reject your assertion. The number of citations is an indicator of popularity, not scientific merit. It's understood that challenging SR and requiring evidence for its reciprocal time dilation isn't popular. Lack of popularity does not determine which interpretation of time dilation is correct. Only evidence can do that. Wrong. It's an indicator of how many other scientists found it useful, given the evidence. And we have lots and lots of evidence that it's correct, starting with Michelson-Morley and Fitzeau, and moving on with the muon experiments and the X-ray crystal reabsorption experiments. Then there's Gravity Probe B and GRACE, not to mention GPS. Then there's Stern-Gerlach. Then there's Eddington. Then there's all those college lab experiments (TechnoCreed: ;) ). The evidence says SRT correctly describes reality. Overwhelming evidence. Over a hundred years worth of evidence. Multiple different lines of evidence, in multiple different disciplines. No, it doesn't. GPS. Muon lifetime. The X-ray crystal reabsorption experiments. All three of those confirm that there is no directionality in time dilation. Da Schneib, you are correctly presenting the classical view of frames. No, I'm not. I'm presenting the relativistic view of frames. There is no time dilation in classical physics. Kipreos is indeed challenging us to rethink this view. No, he's not. He's denying a hundred years of experimental results. The truth of this view isn't in the age of an assertion but the evidence for it. But the age gives lots of time for evidence to be gathered, and none of it agrees with Kipreos. As it happens, framing in relativity is the weak link in theory; much of what is asserted about frames is unproven (such as the presumed impossibility of establishing an absolute frame). Michelson-Morley proves there are no preferred frames. It's persuasive; it's consistent; it has virtues as a theory. But evidence for reciprocal time dilation doesn't seem to exist. GPS. The muon experiment. The X-ray crystal reabsorption experiment. If evidence for it can be acquired, we'll cement SR's place in cosmology unchanged, which would be a good thing. It's been acquired. See above. Let me explain just the GPS evidence: the same amount of time dilation must be compensated for no matter whether the GPS satellites you lock onto are approaching or receding. That right there blows Kipreos out of the water. There is no directionality involved. It's just that simple. It's actually pretty bad that PLOS ONE had a biologist as the reviewer of a physics article written by a biologist. That was a very bad editorial decision which tends to reduce the credibility of PLOS ONE. Which is a shame. It also tends to discredit all open-access journals, which is an even bigger shame. It's reminiscent of the discrediting of philosophy by the Sokal Affair (which anyone competent can look up on Wikipedia). In the eyes of physicists, this completely discredited Derridist deconstructionist philosophy, and was a major blot on the credibility of all of philosophy. Personally I think the Derridists are nutjobs, and I usually express this by the slogan, "deconstruct deconstructionism." SR has long been a sporadic hobby of mine re thought experiments & exploring other views when I have the time, discussion on directional aspect has my interest piqued however. Along with SR is the proposition (I think down to Einstein) that history (of current IRF's) is of no effect, not relevant ! Please indulge a thought experiment I'd like some feedback on. Two rockets A & B (in space) are approaching each other at 0.9c at constant V to pass each other close enough to observe without collision (or G forces!) but, both inhabitants memory & their rocket's records are erased ie So *any* previous non-IRF acceleration is effectively extinguished, so no-one can know who started approaching who from any initial condition. From classical interpretation of SR each observer in each rocket should see others clock slowing down but, of course by the same amount so then there is no net change, ie No IRF change etc ? You should say "standard interpretation;" "classical" means pre-QM and pre-relativity (i.e. pre-Michelson-Morley). Your assertion is correct, each observer sees the other's clock as slower. Note that only by one of them undergoing acceleration (i.e., no longer an IRF) can the clocks ever be compared. As long as both remain intertial, the dilemma can never be resolved. This may help your thinking, Mike. On edit: also, if they arrive at the same point, they collide, and both undergo acceleration, then neither is an IRF any more; and their clocks will agree, solving the paradox. Oh, and one last point: a third inertial observer, who observes both of the other observers' spaceships approaching or receding at opposite velocities will observe both of the original observers' clocks as equally slowed. This observer also cannot check either clock without undergoing acceleration, or without one or both of the original observers undergoing acceleration. Not the way of Winky Pop. DS wrote, "And we have lots and lots of evidence that it's correct, starting with Michelson-Morley and Fitzeau, and moving on with the muon experiments and the X-ray crystal reabsorption experiments. Then there's Gravity Probe B and GRACE, not to mention GPS. Then there's Stern-Gerlach." We have lots of evidence for time dilation. But which of these experiments teases out the distinction between reciprocity as opposed to directionality? Only GPS. And there, if you use SR's reciprocal time dilation, you get the wrong geopositions. Only directional time dilation yields the correct answer. That result validates GR, not SR. I agree that the theoretical arguments for SR's reciprocity and framing are persuasive. It's tough to want to go against those arguments - and I'm *not* going against them. I'm only asking for evidence to demonstrate that reciprocal time dilation is real. Not just time dilation, lots of experiments show that. *Reciprocal* time dilation. Only one example is required. And there, if you use SR's reciprocal time dilation, you get the wrong geopositions. Only directional time dilation yields the correct answer. BS. Link and quote if you claim otherwise. You're just making stuff up here. GRT is based on SRT. You can't separate them. Let's review this. GPS shows that time ticks from satellites moving AWAY must be adjusted USING THE SAME EQUATION as time ticks from satellites moving TOWARD. We done here? Sorry I'm trashing your pet conjecture, but when your conjecture doesn't agree with reality you give up the conjecture, not reality. You don't have to be a scientist to comprehend this. Recall "classical" is ONLY Adjective, NOT "assumptive" pronoun confused by other lesser educated mortals, IIRC same in colloquial american from my 30+ yrs. Please, Not asserting/asking, you are correct. But, thanks replying any alternative views & why ? Sure (lets call this Part 1.1) however, it depends how far away as it affects the time it takes to send/receive a (laser) signal & whether he is already moving *equally* to A & B re perpendicular - which we hope is also equal to both. Ideally the 3rd observer should be perpendicular to the point where A & B pass each other and not moving along that line at all. Say 10m from that cross over & on the z axis equidistant about the center of A & B passing.